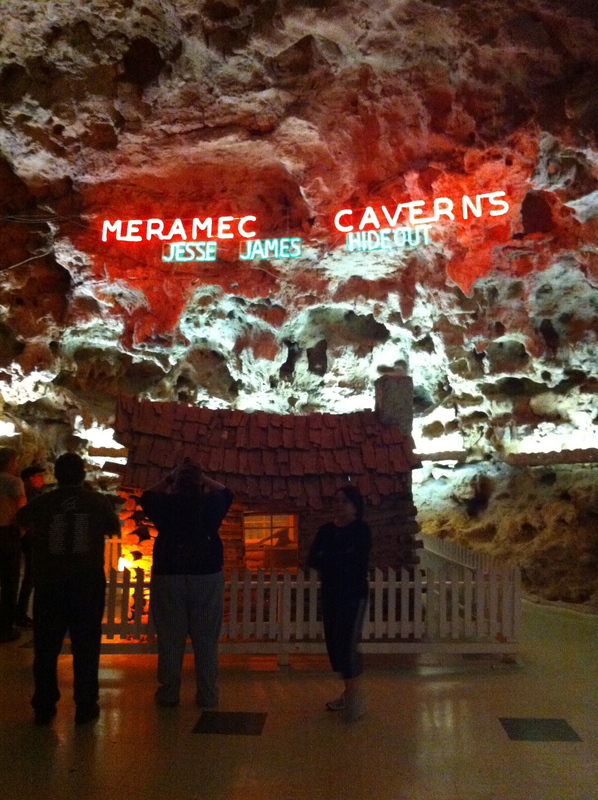 Driving down I-44 (or farty far as St. Louisans call it), it is virtually impossible not to see ads for Meramec Caverns. The billboards, as old as the interstate itself, are delightfully tacky and it is a fun game to count the number of billboards. After about 30 miles of non-stop billboards, I finally reached the exit for the cavern, way out in the podunk town of Stanton. From there, it is another 3 miles on a two-lane roller to the entrance of the cave. Picking up where the billboards left off on the tackiness theme, you actually walk into the cave through a gift shop. Tours are every 20-30 minutes starting at 9:00 AM and last around 90 minutes. My tour guide, Nathan, had that classic Missouri curly mullet. The cave itself is two sections, the upper and lower. The lower part of the cave is mainly a large passageway with an underground river. The owners of the cave put in tacky props along the way as well. For example, when Nathan talked about the outlaw Jesse James, he then pointed to a cardboard cutout of Jesse propped up in the cave. While there is no doubt that the cave was used in the 1800’s, the evidence that Jesse James himself came into the cave is extremely circumstantial. The entrance to the cave. The house is a replica of Jesse James’ house. The upper part of the cave contains most of the cave formations including stalagmites, stalactites, columns, and flowstone. Additional tackiness includes using multi-colored cave lights with requires oohs and aahs from the group and, the grand finale, a light show projected on flowstone to the soundtrack of “God Bless America”. For everyone who enjoys cheesiness and Americana, Meramec Caverns does not disappoint. 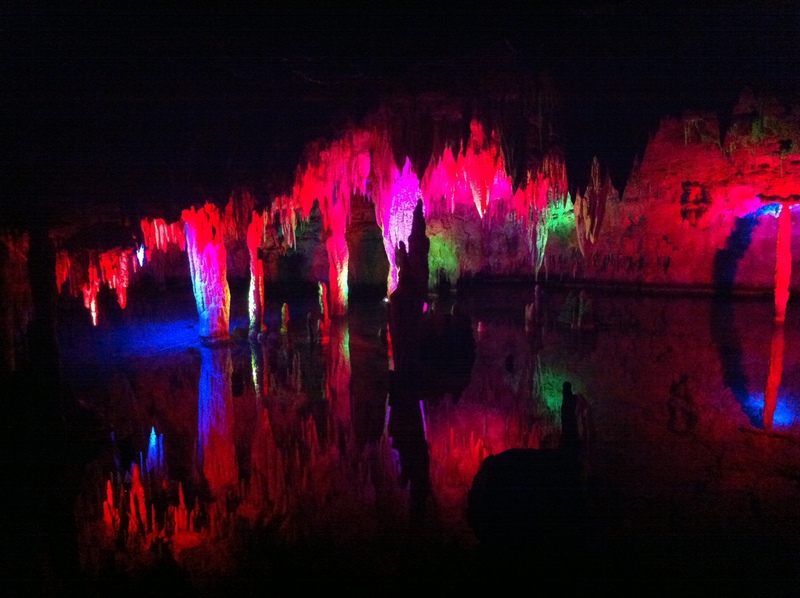 Stalactites on an underground lake in the upper cavern. Also of note, the people watching here is first-rate.